Daily home delivery of The Herald Journal (Tuesday-Sunday) within our local Cache County, UT, and Franklin County, ID, delivery areas plus unlimited digital access, at $11.75/mo., with the weekly LDS Church News delivered every Saturday with your paper, for an additional $24/year. Delivery begins about two business days after you have placed your order. Monthly payments will be automatically deducted from your checking, credit or debit card account through The Herald Journal's EZ Pay system. For rate questions, please call Subscriber Services at (435) 752-2128. Home delivery of The Herald Journal within our local Cache County, UT, and Franklin County, ID, delivery areas 6 days a week (Tuesday-Sunday), plus unlimited digital access. Delivery begins about two business days after you have placed your order. Monthly payments will be automatically deducted from your checking, credit or debit card account through The Herald Journal's EZ Pay system. Enjoy home delivery of The Herald Journal within within our local Cache County, UT, and Franklin County, ID, delivery areas every weekend (Friday-Sunday) plus unlimited digital access. Delivery begins about two business days after you have placed your order. Monthly payments will be automatically deducted from your checking, credit or debit card account through The Herald Journal's EZ Pay system. Digital subscriptions include unlimited access to The Herald Journal website and the e-Edition, our page-flip digital replica of the paper. Monthly renewal payments will be automatically deducted from your checking, credit card or debit card account through The Herald Journal's EZ Pay system. Daily home delivery of The Herald Journal (Tuesday-Sunday) within the Box Elder/Rich County, UT & Bear Lake/Caribou County ID, delivery areas plus unlimited digital access, at $13.75/mo., with the weekly LDS Church News delivered every Saturday with your paper, for an additional $24/year. Delivery begins about two business days after you have placed your order. Monthly payments will be automatically deducted from your checking, credit or debit card account through The Herald Journal's EZ Pay system. Home delivery of The Herald Journal within our local Box Elder/Rich County, UT, & Bear Lake/Caribou County, ID, delivery areas, 6 days a week (Tuesday-Sunday), plus unlimited digital access. Delivery begins about two business days after you have placed your order. Monthly payments will be automatically deducted from your checking, credit or debit card account through The Herald Journal's EZ Pay system. Home delivery of The Herald Journal within our the Box Elder/Rich County, UT, and Bear Lake/Caribou County, ID, delivery areas every weekend (Friday-Sunday) plus unlimited online access. Delivery begins about two business days after you have placed your order. Monthly payments will be automatically deducted from your checking, credit or debit card account. 8Print-Digital Combination Subscription w/church ne$21.00 for 30 daysPrint subscriptions include home delivery and unlimited access to The Herald Journal's website and e-Edition w/Churh news for an additional $21. Click select to view delivery options and pricing. When Britten Schenk tells the audience at a Hyrum fireside that “I’m so thankful that I am here,” it’s more than a figure of speech. 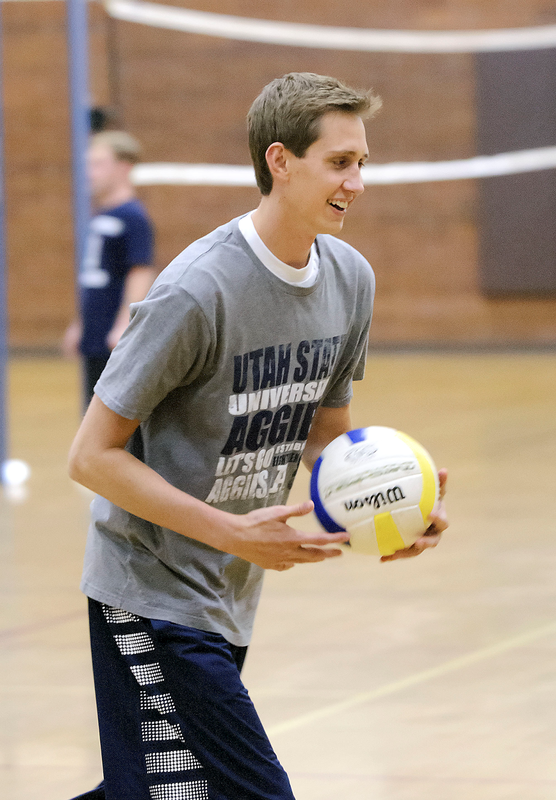 After being hit by a bus on March 16, 2012, while serving an LDS mission in Sao Paulo, Brazil, Britten has spent the last 18 months recovering from a traumatic brain injury. During that year and a half he has had to learn to talk all over again as he dealt with the frustrations of memory loss, and he still suffers daily bouts of nausea, nerve pain in one foot and headaches brought on by the titanium plate in his skull. Through it all, Britten has remained remarkably upbeat, stunning family, friends and therapists with his swift recovery and his knack for putting others at ease. 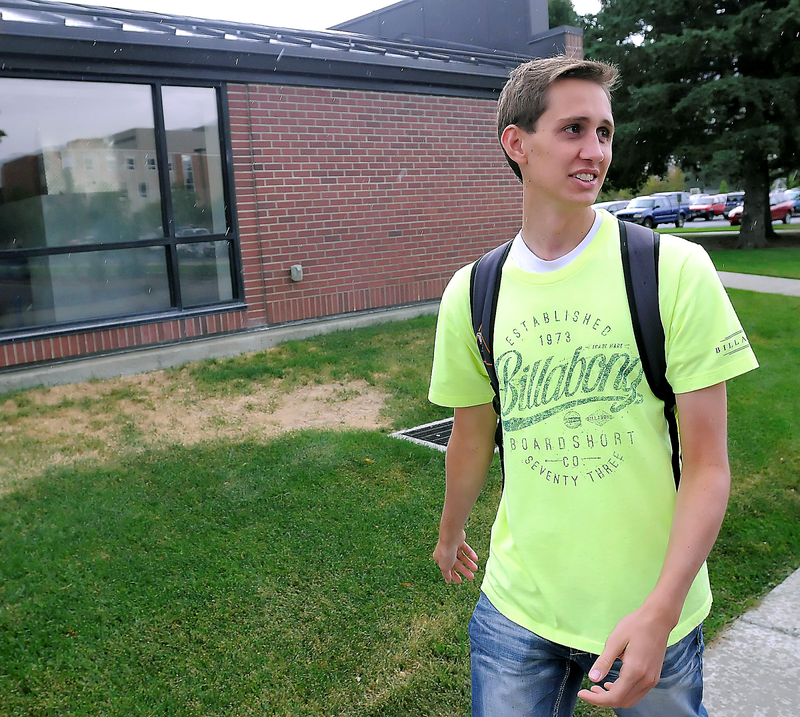 To watch Britten casually navigate the campus at USU, where he is again taking classes, or to hear him chat with friends, one would never guess that doctors originally told Britten’s parents that he wouldn’t live. But the fact that the 22-year-old looks so normal masks the enormity of the challenges he still faces. In a speech therapy session in mid-September, Britten struggles to come up with the word connected to these three words: beverage, white, cow. He finally works his way around to “milk,” but it takes 15 seconds. The next word, “pillow,” he gets immediately after hearing the clues soft, head and sleep. But that is the nature of traumatic brain injuries and aphasia, where one’s language memory bank is basically wiped clean and has to be rebuilt one word at a time. “Everybody thinks he’s great, he’s better, but they have no idea of the struggles he faces,” says Britten’s mother, Karla Schenk. The letter includes a well-known quote: “Just as a gem cannot be polished without friction, a man cannot be perfected without trials.” To this day Karla wonders if the letter wasn’t a foreshadowing of things to come. Britten was about 21 months into his mission for The Church of Jesus Christ of Latter-day Saints, three months from returning home, when he and his companion prepared to cross a busy street in Sao Paulo, the ninth-largest city in the world. With their view blocked by a large post, his companion hung back as Britten stepped into the street. A bus traveling at an estimated 30 mph struck Britten solidly on the left side of his head. Taken to a nearby hospital, Britten lapsed into a coma as his parents, Steven and Karla, scrambled to catch a flight to Sao Paulo. The news they received when they arrived at the hospital was not good. “There’s nothing we can do for him. He will not survive,” one doctor pronounced. Surgeons had removed the left side of Britten’s skull to release pressure from swelling, and no blood or oxygen were getting to his brain. “We were going to the hospital to tell Britten goodbye,” Karla says. The next day the medical staff reported that some blood was flowing to his brain and upgraded their forecast to a chance of survival, but little chance of regaining function. Soon after that Steven and Karla spoke to Britten’s peers at a mission conference, passing along the assurance they felt they’d received: Britten would be OK. They stayed in Brazil for a month and had what Karla calls “many discouraging days in the hospital” as Britten, once he woke from the coma, battled pneumonia, fevers as high as 106 degrees and diabetes insipidis. About a month later he was cleared to return to the United States, and was transferred to Salt Lake City in a private jet with full medical crew. Karla says that in those early days the joy of seeing Britten alive was tempered by the step-by-step revelations of how serious his injuries were. Finally, by the end of May, Britten was cleared to return home to Hyde Park. The family continued to come to terms with his limitations, which included severe damage to his eyes. Although he has experienced some improvement in sight in his left eye, the nerves in his right eye were severed and he has no sight on that side. In that left eye, which also experienced nerve damage, about half remains dark, while one fourth has some limited vision, and the “good” quarter has 20/60 vision. His peripheral vision remains so limited that he is unable to qualify for a drivers’ license. Sight restrictions haven’t kept Britten from staying actively involved in sports, one of his loves during high school, when he carried 165 pounds on his 6-foot-2 frame as a champion swimmer. (After the accident he lost 50 pounds. He now weighs about 145.) He plays volleyball once or twice a week, and his quick reflexes and soft hands reflect the athleticism that made him an excellent basketball player. It speaks to his courage that, with what is essentially tunnel vision, he is willing to step onto a volleyball court and face sizzling spikes. During the past year Britten has attended speech therapy several times a week, first working with Kathy Gantz at Logan Regional Hospital, usually accompanied by his mother or grandfather. As Steven works with his construction business, Karla has been Britten’s near-constant companion. As Britten has become an in-demand public speaker, together they have made the rounds, including a visit to a juvenile lockdown facility in Provo where Britten spoke a couple of months ago. After his presentation, says Karla, many of the boys “lined up to hug him and shake his hand,” while others quickly left the room. Then those who had left returned, carrying pencils and paper, asking for Britten’s autograph. “Half of them were crying,” Karla adds. “It was pretty awesome.” Not long after, Britten began to receive letters from those young men. One gave his thanks for “helping me feel that I can have faith again.” Another said he planned to be baptized into the LDS Church when he returned home to Nova Scotia. Traumatic brain injuries are notoriously fickle. According to webmd.com, while post-TBI physical impairments can hinder functional independence, the behavioral, cognitive, emotional, psychosocial and personality changes associated with TBI frequently lead to even greater problems. In other words, re-learning to speak is tough enough, but most victims of brain injury suffer other, serious side effects. Many people dip into major depression or mood swings, and doctors have a hard time predicting how each situation will play out. Very often the person becomes despondent or experiences bouts of rage. Among TBIs, Britten’s has to rank among the most serious, which makes it all the more amazing, those around him say, that he is more or less the same person he was before the accident. “His personality is the same, he’s the same funny kid,” says Britten’s high school buddy Frank. Since they spend so much time together doing homework and attending speech therapy, Britten says, the easy target when he does lose his temper is the person closest to him: Karla. The aphasia has made school a tremendous challenge for Britten, even though it had no impact on his intelligence. The problem is simply retrieving words. Britten’s grandfather, Val Andreasen of Providence, remembers his grandson being asked what color the grass was soon after the accident. He could write the word “green” but couldn’t say it. Now imagine trying to write a college-level essay without a full range of vocabulary. His verbal expression has improved quickly, and the goal in his weekly sessions now is to “transfer that into writing.” Amundson said that re-learning after aphasia isn’t as easy as simply hearing and immediately “recovering” lost words. Usually it takes multiple repetitions to lodge a word firmly in the memory bank, although she says with Britten, “It’s amazing how often he can hear something once and have it.” His injury impacted his ability to write, to speak, to listen and to read, she notes. So impressed was Amundson with Britten’s progress that she nominated him to be the ambassador for Utah’s Speech-Language Hearing Association. He accepted that position, which has led to yet more public speaking. Britten grew up in Bancroft, Idaho, the second of four boys. (His older brother, Logan, and his wife Lora live in North Logan. Canon is a senior at Mountain Crest, and Jaxon is a 7th-grader at Cedar Ridge Middle School.) As a grade-schooler Britten struggled, and he was diagnosed with ADHD in third grade. In 7th grade his first-semester report card was filled with F’s. Knowing he had to improve, Britten forced himself to do his homework before texting friends. Eight years ago the Schenks moved to Nibley (they now live in Hyde Park). Along the way Britten became such a good student that he graduated from Mountain Crest with a 3.9 GPA and 28 college credits under his belt. Britten loved being outdoors, playing ball and hanging out with friends. As a 5-foot-5 sophomore he feared he wouldn’t be able to make the basketball team at Mountain Crest, so he went out for swimming. He made the team but was relegated to the 6th (slowest) lane. A couple of months later basketball tryouts began and Britten decided to try out after all. He would go to a two-hour swim practice and then hustle to the gym for tryouts. He made it to the final cut and realized he might have a conflict between the two sports, so he went to the basketball coach and told him he was also swimming. Britten was cut on the final day of tryouts. That didn’t mean the end of basketball. 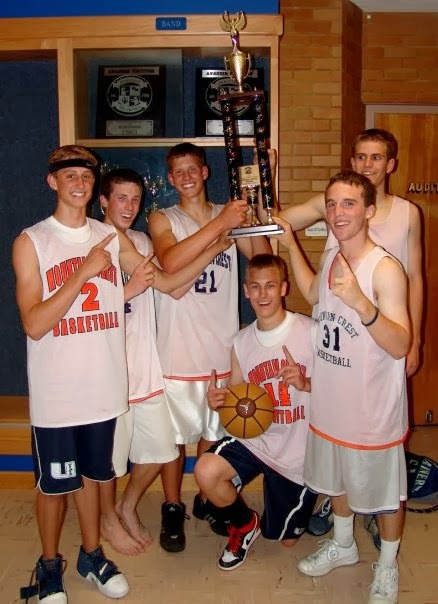 He and some buddies put together a rec league team they dubbed the Cyclones, and the members of that team are close to this day. Meanwhile, in the pool, Britten moved up lane by lane, becoming a captain as a junior. As a senior he finished fourth at state in the backstroke and was part of a state champion relay team. One summer Britten arranged for four of them to go to Grace to check out his old stomping grounds. They loaded 4-wheelers and headed out to camp, arriving after dark in a clearing, where they set up tents. In the morning they found themselves in a pasture pocked with cowpies, the tents smeared with manure. Then they went to “shoot the flume,” floating down an irrigation canal, only to encounter water so low they were soon covered in leeches. Such a disastrous weekend couldn’t help but become a treasured memory. “Everything went wrong but it was a super-good time,” Jergenson says. Britten smiles when he talks about the seven Cyclones, whose mothers met monthly while they were on their missions to update one another on their sons’ progress. 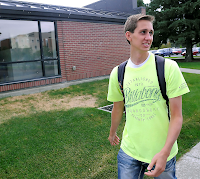 After high school Britten enrolled at USU for a year and took pre-med classes, planning to become a dentist. Only one general class remains for him — English 2010, which he is taking now. 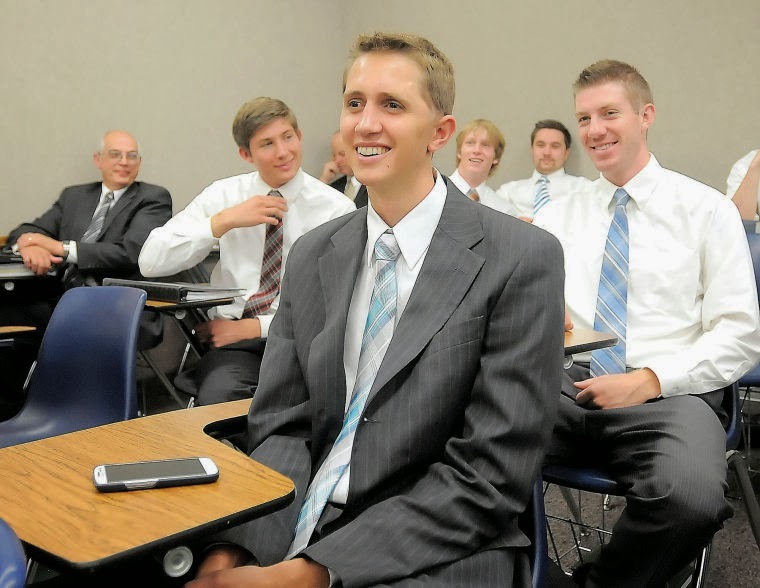 When he accepted his mission call in early 2010, it fulfilled a lifelong goal. Since last month, Britten has lived in an apartment on Darwin Ave. with four roommates. 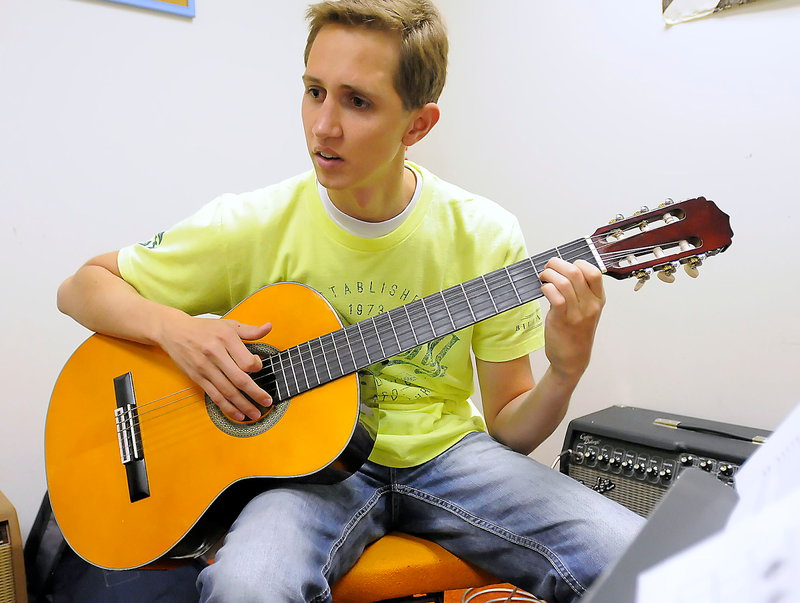 His classload at USU includes a guitar class, an LDS Institute class, regular speech sessions and that English 2010 class. He was taking a careers course at the beginning of the semester, but had to drop that one after the writing demands became too great. It’s all part of Britten figuring out how much he can handle as a student. A few weeks ago, reading a single page from his English text took 40 minutes, and he was reading about 50 words a minute. By late September he was reading 90 words per minute. It’s too soon to say whether that will be enough for him to thrive at a college level. One of his goals right now is to settle on a career. Weighing factors such as work atmosphere and family time, he has tentatively narrowed his interests to coaching, working in a parks and recreation department, and physical therapy. He considered speech therapy but reasons that his physical endurance is greater than his mental endurance right now, and speech therapy is mentally fatiguing. His own physical recovery, which started with learning to walk with support and progressed to agility work with Nick Smith at the Sports Academy and Racquet Club and appointments with medical specialists in spine, throat, stomach, neurology, vision and digestion, is still ongoing. The closest thing he has to a job now is traveling the public speaker circuit, although that doesn’t generate income. Still, he enjoys the presentations and the effect he has on others. “I like doing those (presentations) because it makes me feel like I’m still on my mission,” he says. Then there is the social component. Although Britten is very comfortable socially — during a recent lunch at the USU cafeteria he easily struck up a conversation with the student sitting next to him — his demanding schedule makes it hard to find the time and energy to pursue girls. At the same time, he says, he knows he can’t “just wait for God,” but needs to do the best he can each day. Britten stays other-focused — he’s thrilled for his brother Canon’s upcoming senior season on the Mountain Crest basketball team — and patiently works on his recovery, once again moving up one lane at a time.